Rich in protein and fiber, chickpeas are a versatile ingredient that can enliven a variety of dishes. 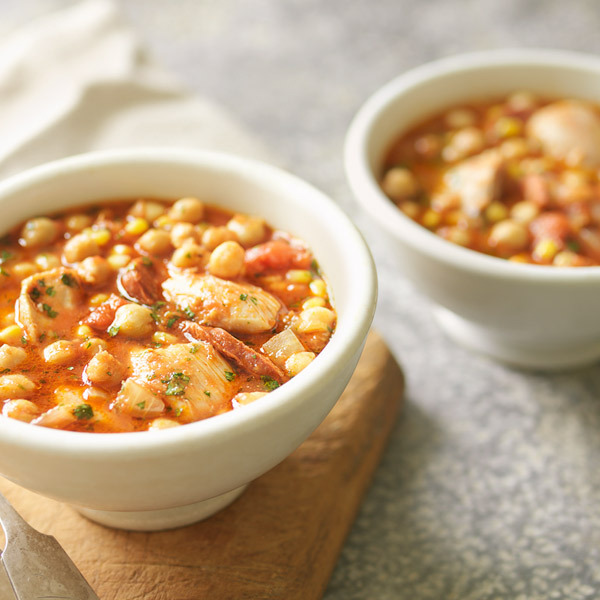 In this hearty stew recipe, we've combined canned chickpeas with chicken, chorizos, cilantro and corn. Serve this protein-packed chickpea soup with crusty bread for a fast, filling and flavorful meal the whole family will enjoy. Preheat oven to 350°F. In 5 quart Dutch oven, heat 2 Tbsp. oil over medium-high heat. Sprinkle chicken with salt. Cook, in batches, until golden, about 5 minutes. Transfer to plate. Add remaining 1 Tbsp. oil, onion and garlic to pan. Reduce heat to medium and cook, stirring frequently, until tender, about 7 minutes. Stir in chorizos, cumin, oregano and cayenne. Stir in tomatoes; break up with spoon. Add chickpeas, half of cilantro and chicken; bring to a boil. Cover and bake 25 minutes. Stir in corn and bake 5 minutes. Stir in remaining cilantro.